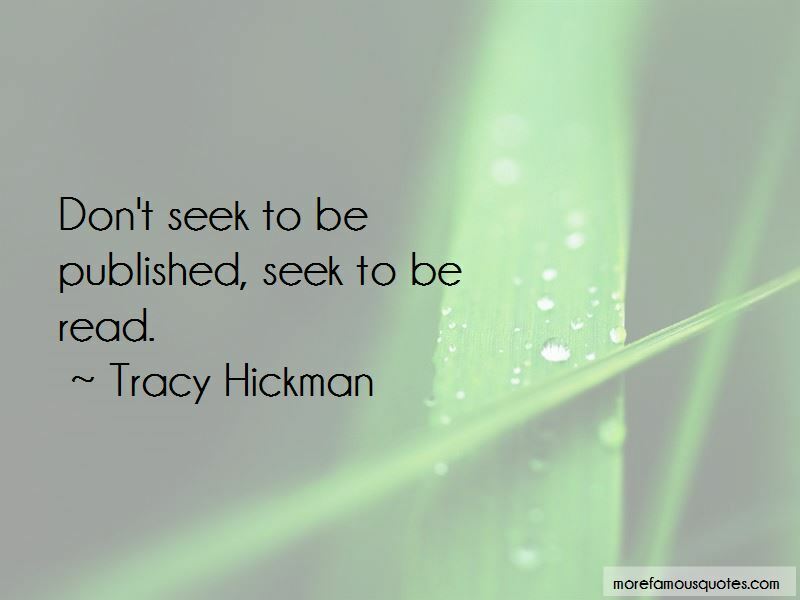 Enjoy the top 24 famous quotes, sayings and quotations by Tracy Hickman. [A] couple I had known - who were old friends - asked me what I was going to work on next. I told them I wanted to write a near future book about AIDS concentration camps. They were vehement in their response: they thought it was a terrible idea. Their words both shocked and saddened me. "Do you really want to write a book about homosexuals?" they asked me. "Won't people who read your work be influenced toward sin?" I notice that I don't hear from them much lately. This wasn't in the histories", Raistlin murmured to himself, staring down at the little wretched bodies, his brow furrowed. His eyes flashed. "Perhaps", he breathed, "this means time has already been altered?" For long moments he sat there, pondering. Then suddenly he understood. None saw Raistlin's face, hidden as it was by his hood, or they would have noted a swift, sudden spasm of sorrow and anger pass across it. "No," he said to himself bitterly, "the pitiful sacrifice of these poor creatures was left out of the histories not because it did not happen. It was left out simply because-"
“I don't understand, Your Majesty." “Darkis pointed toward the dwarf sitting btween them on the ground. "Uh, don't you think that's a bit much?" Turi and Ethis each held separate ropes around the bound hands and feet of the dwarf. A gag was tied tightly over hi mouth. Ethis considered the prisoner for a moment before replying. "No, it seems a resonable precaution." "Why? What did he do?" Darkis said. The chimera looked at each other, thier blank faces considering for a moment. "He kept promising not to escape," Thuri answerd at last. "He promised not to escape," Darkis asked, his brow furrowed with the puzzle, "and so you tied him up?" "He wouldn't shut up about it," Ethis replied, his large eyes blinking indignantly. "He kept going on and on about how we could trust him and how he had nowhere to run and how he was glad it was us who took him as a slave captive of war." “So dark. Endless darkness, eternal. It was not the absence of light that was so frightening as the absence of thought, of knowledge, of comprehension. Our lives, the lives of the living will go on. The sun shines, the moons rise, we will laugh and talk, and he will know nothing, feel nothing. Nothing. I've always been fascinated by the Norsemen, their lives, history and cosmology. The more we study them the more interesting they become ... breaking their own stereotypes. We usually think of them as barbarians, but there were aspects to their society that shows a tremendous level of civilization, sophistication and social advance. There is a scene in one comic from the '60s-'70s where Batman finds a film, a newsreel film, of his father. This newsreel film is from the '50s, and his father has come to this costume ball in a Zorro costume, which strangely enough looks a lot like a Batman suit in the footage. 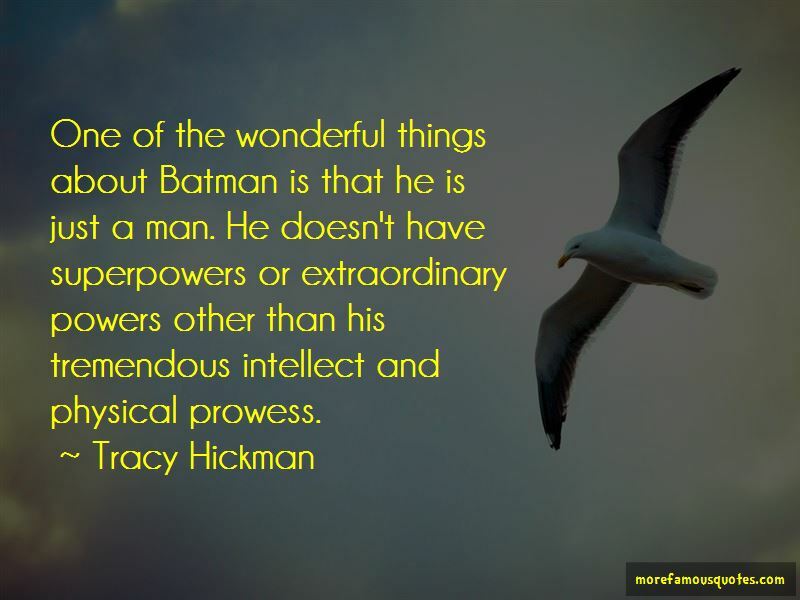 Want to see more pictures of Tracy Hickman quotes? 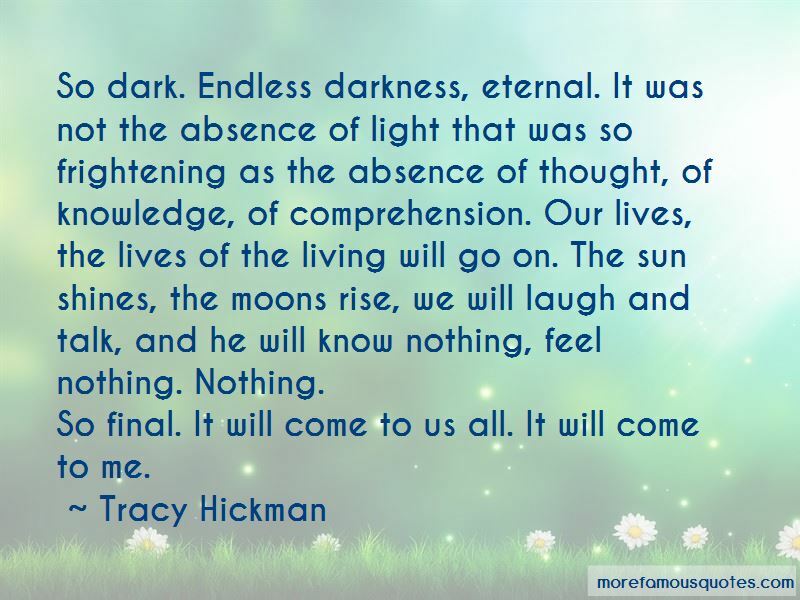 Click on image of Tracy Hickman quotes to view full size.